TSPSC has notified that on the basis of the results of the Main Examination held on 16/05/2018 FN &AN and Oral Test (Interview) held on 14/12/2018 FN at TSPSC Office, Hyderabad, 05 candidates with the following Hall Ticket Numbers have been provisionally selected against 06 vacancies for appointment to the post of Principal (Junior Colleges) in MJPTBCWREIS vide Commission’s Notification No.25/2017, Dt:02/06/2017, the selections have been verified and published here-with subject to the following conditions. If it comes to the notice of the Commission at a later date that any candidate furnished false information or the selection is not in order due to any act of omission or commission of any candidate , then his/her provisional selection is liable to be cancelled at any stage and he/she will forfeit all consequential benefits including that of selection, besides that the Commission reserves the right to take any action as it deems fit in the circumstances of the case, in terms of the various provisions as notified in the Notification No. 25/2017. 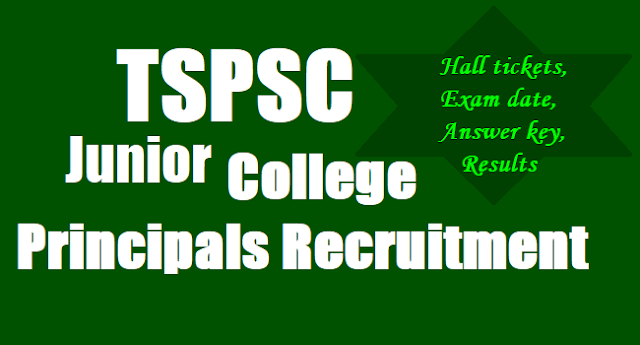 TSPSC RJC Principals Results, Certification Verification Dates, list of documents 2018: On the basis of Main Examinations held on 14/05/2018 and 16/05/2018 the following candidates with Hall ticket numbers have been provisionally picked up for Certificate Verification for the posts of Principal in Schools and Principal in Junior Colleges in various Residential Educational Institutions Societies respectively and the details are as follows. Notification No.25/2017:Gurukulam/Residential Junior College Principals Recruitment 2017: TSPSC has published the Junior College Principals Recruitment 2017 notification on May 1 and online applications are invited Online from qualified candidates through the proforma Application to be made available on Commission’s WEBSITE (www.tspsc.gov.in) to the post of Principal (Junior Colleges) in Residential Educational Institutions Societies. i) A Second Class Master’s Degree (M.A/M.Sc/M.Com) or its equivalent from an institution recognized by the UGC, in the relevant College subjects (Annexure-A) for which the Junior Lecturer(JL) are eligible with not less than 50% of marks in aggregate or its equivalent. ii) In case of SC/ST/BC/ Differently abled candidates, the minimum marks shall be 45%. B. Experience iv) A total teaching experience of not less than (8) years including not less than (5) years as J.L / PGT in any Government / Aided / Government recognized High School / Junior College and (3) years of administrative experience as Head Master/ Principal of Government / Aided / Government recognized High School/ Junior College. The fee once remitted, shall not be refunded or adjusted under any circumstances. Failure to pay the application fee, wherever applicable will entail total rejection of application. The list of Banks providing service for the purpose of online remittance of fee is given in ANNEXURE - II. NOTE:The question paper of Preliminary (Screening Test) and the question paper of Main examination will be supplied in English version only.